Frugal Mom and Wife: Mrs. Freshley's Red Velvet Cream Filled Cupcakes - Easy Patriotic Dessert! 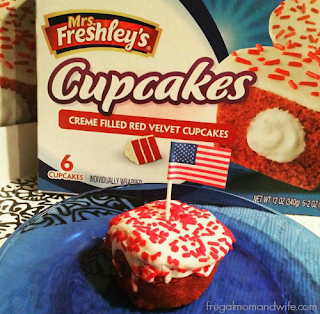 Mrs. Freshley's Red Velvet Cream Filled Cupcakes - Easy Patriotic Dessert! With all the hustle and bustle getting your family, friends and guests all set up for a fun event, anything that can save you time can help greatly. All throughout the year I am baking, cooking and planning for events whether for a holiday or event. When I come across something that I can pull off as both delicious, inexpensive, time saving and pleasing to the eye, I notice. Working with Mrs. Freshley's over the years I have come to a greater appreciation of the snack cake. Honestly I cannot handle to much sugar and do not like my family over indulging themselves with treats. Mrs. Freshley's however has the most yummy snack cakes that take all that extra work of decorating out of the process. That's why Mrs. Freshley's cupcakes can make your life much easier. Just a topper of your choice really sets off the occasion and that's all you do. Above you see a perfect Patriotic Cupcake ready to intrigue my guests, it took seconds for me to make. Thank you Mrs. Freshley's!